The Avalon Morningside Park project includes the design of the landscape surrounding a new 17 story apartment building on the Cathedral of St. John the Divine campus at the corner of Morningside Drive and 110th Street. The site has large rock outcrops protruding from fill added during the Cathedral construction process. 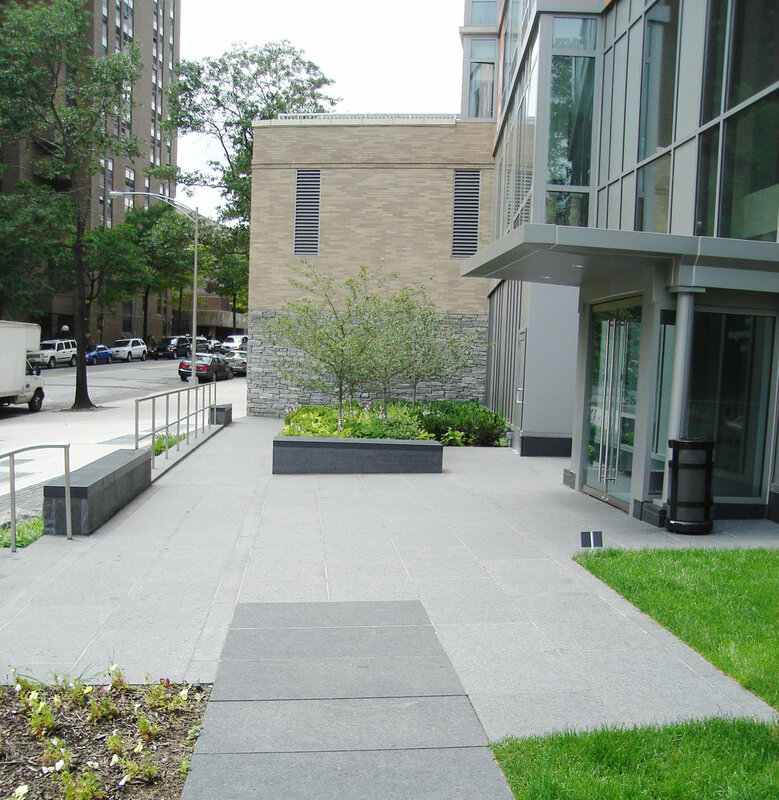 The new landscape transitions between the elevation of 110th Street and the Cathedral Close which is 30 feet above. The rocky character of the site is preserved by exposing the rock substrata then overlaying a large landscaped terrace to provide an open space for tenants. Boulders spill down onto the terrace further enhancing the rustic character of the landscape. Splaying concrete walls help stabilize the steep slope that transitions to the elevation of the Close as the landscape wraps around the new building. Stone walks bridge to the building entrance and provide handicapped access. Additional stones provide seating. The landscape on the Close side is reconfigured to better transition to the new building. The road is realigned to allow a row of trees to be planted along the building facade, a new plaza is provided for the Cathedral School to the north and a new Rose Garden is located to the west of the building as an amenity for the Cathedral.